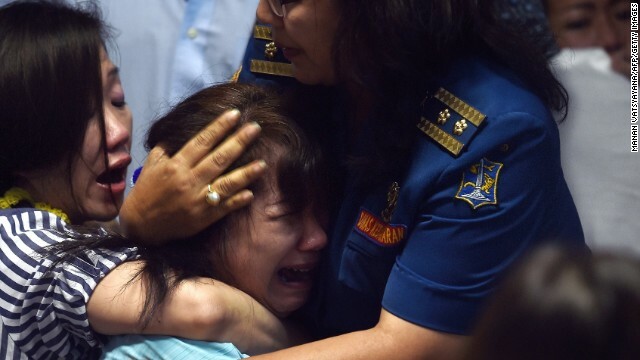 Surabaya, Indonesia (CNN) -- A woman grieving for her brother and his family. Two teenage girls looking for their parents. A woman hoping her fiance is still alive. 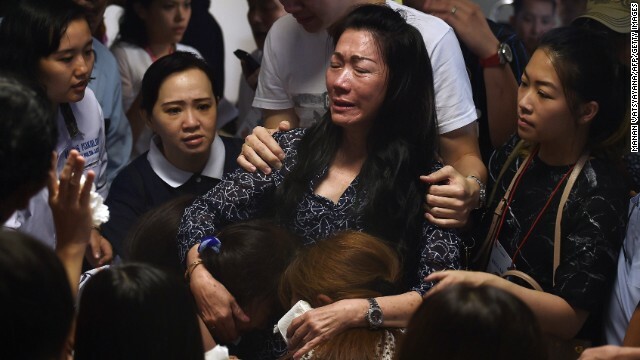 They are among the distraught families of passengers and crew on AirAsia Flight QZ8501 who are gathering at airports in the region, hoping that their relatives are safe. 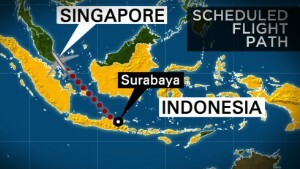 The plane carrying 162 people disappeared Sunday morning traveling from Surabaya to Singapore. Oei Endang Sulsilowati and her daughter arrived at the Juanda international Aiport in Surabaya looking for news of her brother, Oei Jimmy Sentosa Winata, his wife and their 13-year-old son and 9-year-old daughter. "We saw what had happened on the television, and we are coming here to find out what is happening," Sulsilowati said. Members of a search and rescue team carry the body of a victim of AirAsia Flight QZ8501 at Iskandar Airbase in Pangkalan Bun, Indonesia, on Thursday, January 1. 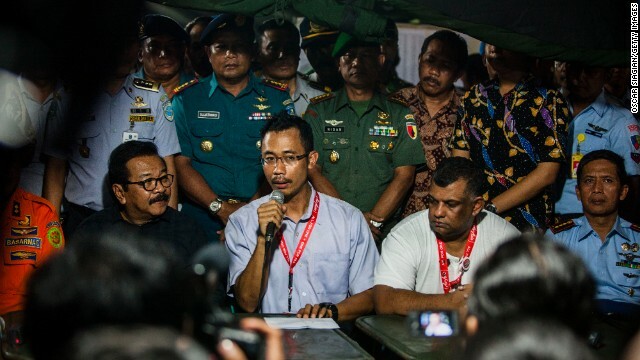 A massive recovery operation has begun following confirmation from Indonesian officials that remains and debris found in waters off Borneo were from the missing plane. 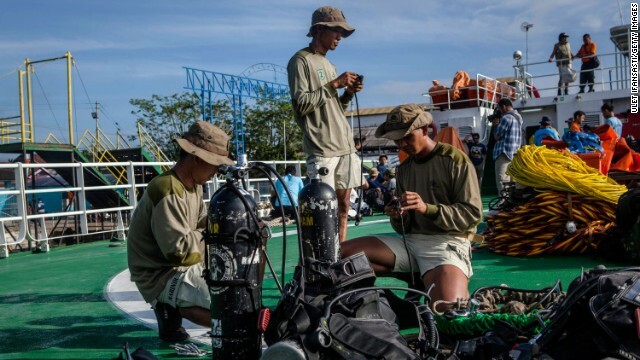 Marine divers prepare their gear on the deck of a ship before searching for passengers and debris from AirAsia Flight QZ8501 on January 1 at Kumai port in Pangkalan Bun. 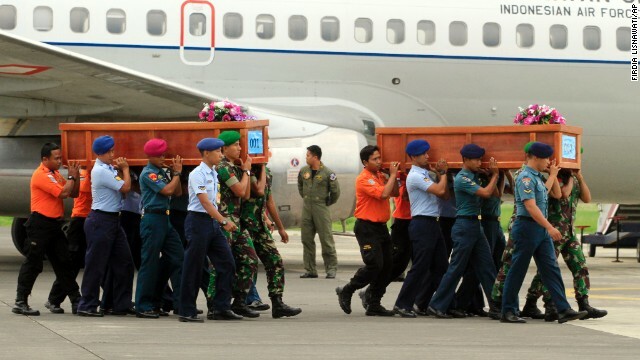 Indonesian soldiers carry a coffin containing a victim of AirAsia Flight QZ8501 upon arrival at an air force base in Surabaya, Indonesia, on Wednesday, December 31. 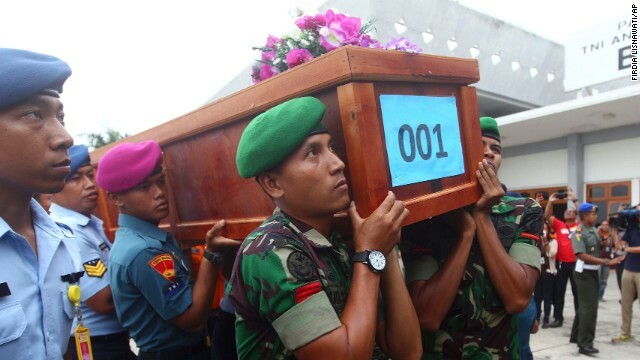 Indonesian soldiers carry coffins of crash victims on December 31. Relatives of passengers pray together inside a holding room at Juanda International Airport in Surabaya on December 31. Indonesian navy divers inspect their gear in Pangkalan Bun, Indonesia, before a search operation December 31. 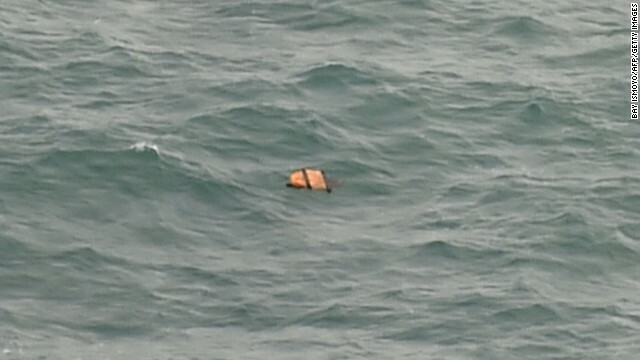 Indonesian Air Force personnel on Tuesday, December 30, show debris, including a suitcase, that was found floating near the site where AirAsia Flight QZ8501 disappeared on Sunday. Debris floats in the Java Sea on December 30. 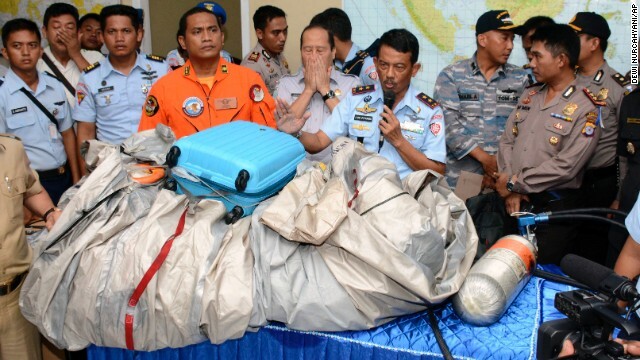 Flight QZ8501 was carrying 155 passengers and seven crew members. A member of the Indonesian Navy monitors a radar screen during a search operation over the waters near Bangka Island, Indonesia, on December 30. 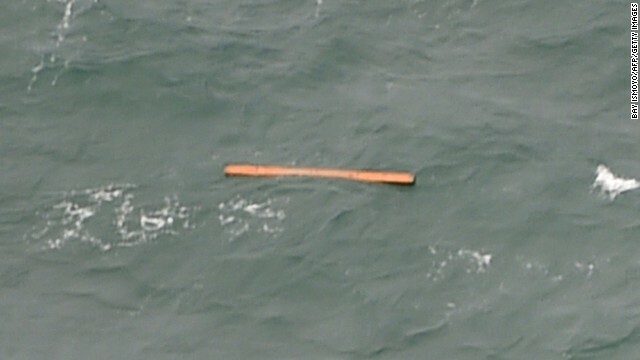 A piece of debris floats in the Java Sea on December 30. 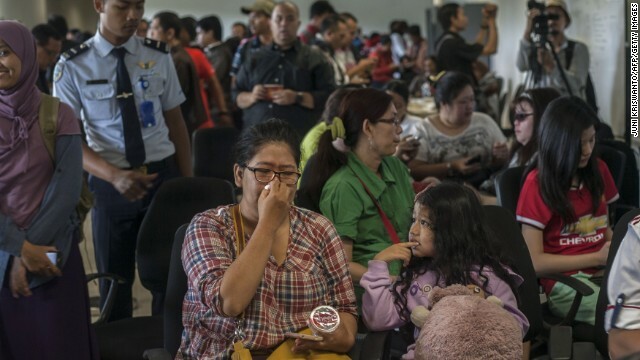 Family members of missing passengers react at an airport in Surabaya, Indonesia, after watching news reports on December 30. Debris floats in the Java Sea on December 30. 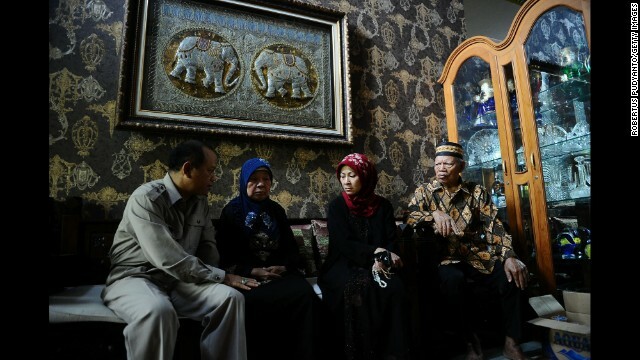 Relatives of the flight's pilot, Captain Iriyanto, gather at his house in Surabaya on December 30. Second from right is his wife, Rr. Widiya Sukati Putri. 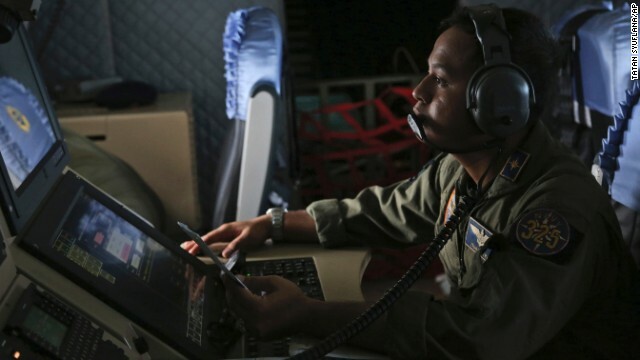 Indonesian Air Force personnel scan the sea from plane windows on December 30. A member of an Indonesian search and rescue team gestures as the team is ferried out to a ship to conduct search operations on December 30. Relatives of missing passengers comfort each other December 30 at Juanda International Airport in Surabaya. Relatives gather at Juanda International Airport as they wait for news on December 30. 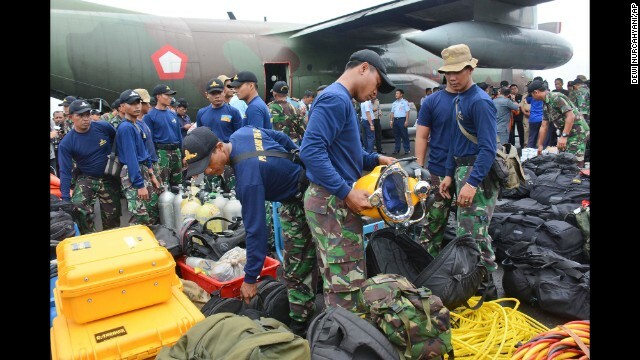 An Indonesian search and rescue team prepares for a search on December 30. 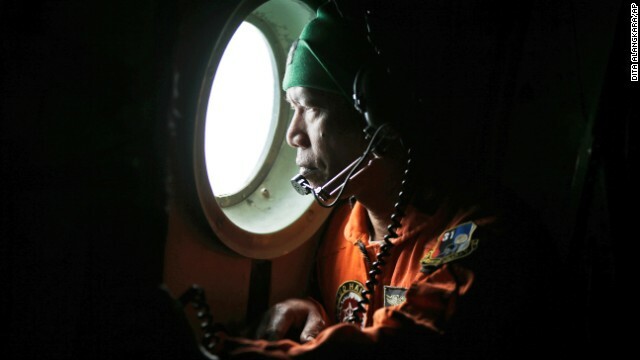 An Indonesian military airman looks out the window of an airplane during a search over the waters of Karimata Strait on Monday, December 29. 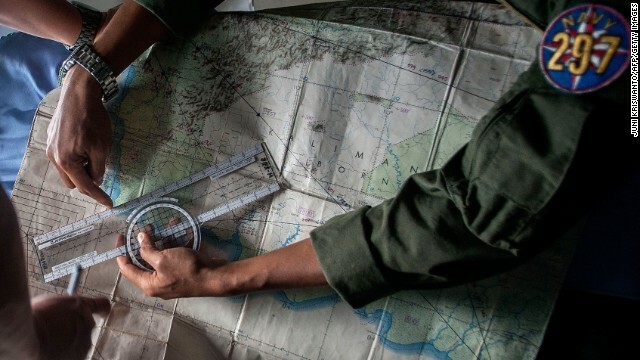 Indonesian Army personnel read a map during a search operation on December 29. 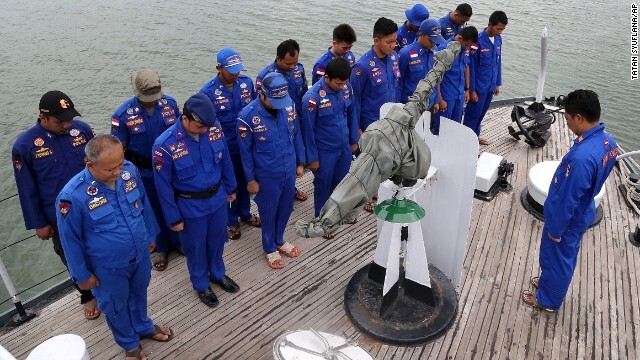 Members of Indonesia's Marine Police pray before a search operation on December 29. Military personnel perform a search operation on Sunday, December 28. Sunu Widyatmoko, CEO of Indonesia AirAsia, announces December 28 that the flight lost contact with air traffic control. 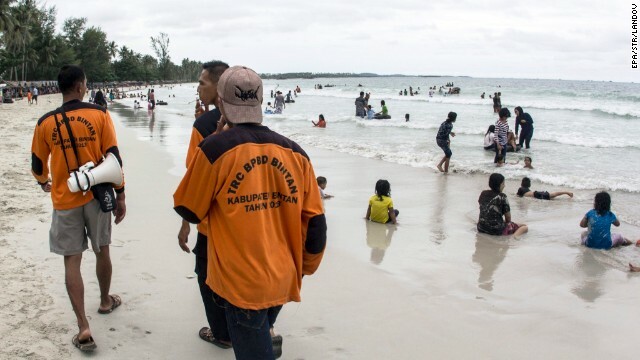 Members of the Indonesian Regional Disaster Management Agency walk at a beach as they search for the missing plane on December 28. 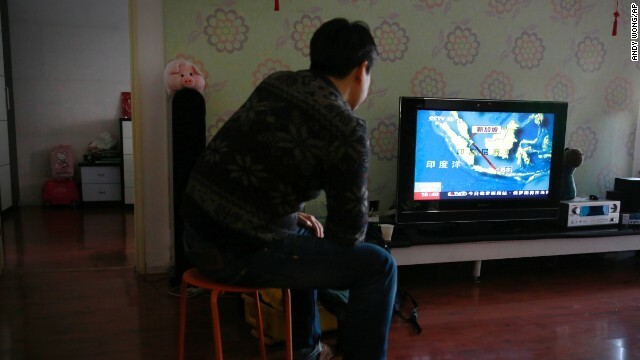 Jiang Hui, whose relatives were on board Malaysia Airlines Flight 370, watches the news about the missing AirAsia flight at his house in Beijing on December 28. Flight 370 went missing on March 8 and has yet to be found. 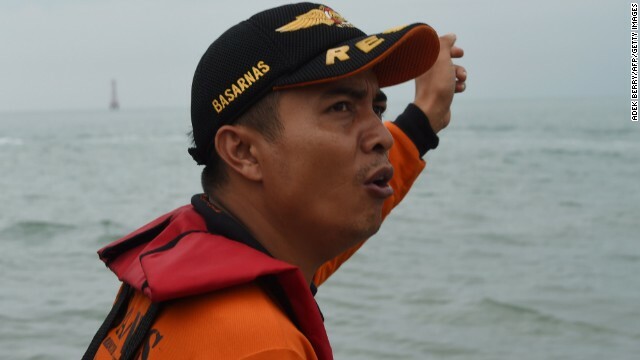 An official from Indonesia's national search and rescue agency points to the position where AirAsia Flight QZ8501 went missing. 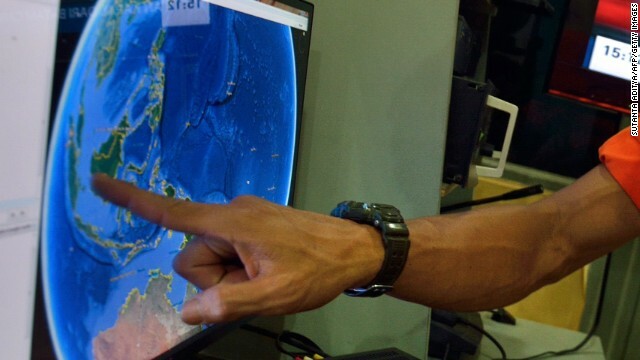 The aircraft went missing as it flew over the Java Sea between the islands of Belitung and Borneo, according to Indonesian authorities. It was bound for Singapore. An official checks a map of Indonesia at Juanda International Airport. Her brother's family was traveling to Japan via Singapore, she said. "I knew about this incident from watching TV and tried to get more information from my family. But my brother never flew with AirAsia, so I kept calm. Then someone told me that they saw his name on TV. "Then I saw it," she said, breaking down in tears. "We are just waiting for news"
"We don't know what to do," she said. "We are just waiting for news." Two young teenage schoolgirls arrived at Juanda International in the early hours. According to relatives and school officials who were traveling with the girls, they are friends whose parents were on the flight. The parents were traveling to Singapore to spend New Year's with their daughters. That flight never arrived, so the girls traveled to Surabaya to find out what had happened to their parents. They sat at a desk staffed by AirAsia officials, looking lost and bewildered, as they waited for information. At Changi Airport in Singapore, Louise Sidharta told Channel NewsAsia her fiance and his family were on the plane. "When I was on the way to the airport, I listened to the radio and they said his plane was missing," she said. "It was supposed to be his last vacation with his family" before the wedding, she said. Indonesia is by far the hardest hit in this mystery because 149 of the 155 passengers were from that country. Surabaya is the crisis center. AirAsia Group CEO and founder Tony Fernandes flew in late Sunday night. His first words at the news conference: "We are very devastated by what's happened, it's unbelievable. "Our concern right now is for the relatives and for the next of kin -- there is nothing more important to us, for our crew's family, and for the passengers' families." On Monday morning, he briefed the families behind closed doors. It's not known what he said. AirAsia staff has been taking families from Juanda International to the nearby Ibis Hotel to keep them together and, critically, to keep them informed. Many family members are in shock. They're teary-eyed, exhausted, confused and afraid. Some are grieving; others exude pure despair. Children are among them, in some cases clearly too young to grasp what's going on. "I should have gone with them but I canceled it two weeks ago as I had something to do," one relative of a passenger said, sobbing, according to a translation by Channel NewsAsia. Speaking at Juanda International Airport, the relative -- whose name was not given -- said, "This morning before I went to pray, one of them called me and jokingly said, 'See you in the new year and goodbye forever.' That's all, and then the bad news came." William Kai, waiting in Surabaya for news of his brother-in-law and three other relatives who were on the flight, said he's hopeful the plane will be found soon, according to the BBC. 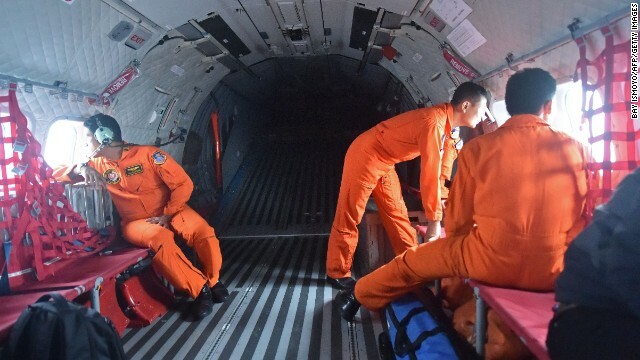 "This flight is only from Surabaya to Singapore, so it's not like it's missing in the Indian Ocean or the big seas," he said. "It's just there. So it should be easier to find." He also said he's not giving up hope for the safe return of his relatives. "We still have hope," he said. "We cannot lose hope." The losses will be felt around the world. 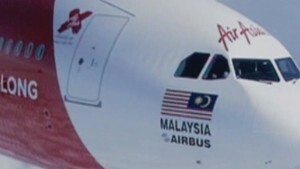 While nearly everyone on the flight is from Indonesia, there are also three South Koreans, one Malaysian, a French co-pilot, one Briton and one Singaporean, the airline said. Sixteen passengers were children and one was an infant. The British national is Indonesia-based energy executive Choi Chi Man, and the Singaporean citizen is his 2-year-old daughter, Zoe, Channel NewsAsia reported. 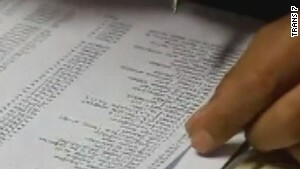 Their names are on a flight manifest released by the airline. 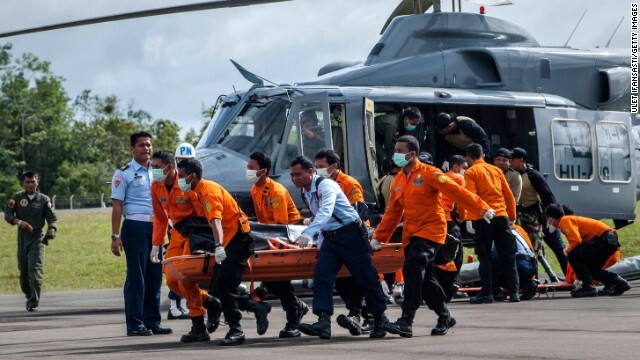 Sunu Widyatmoko, the CEO of AirAsia Indonesia, said the company's "main priority is keeping the families of our passengers and colleagues informed on the latest developments." "We will do everything possible to support them as the investigation continues and have already mobilized a support team to help take care of their immediate needs, including accommodation and travel arrangements," he said. Fernandes took to Twitter to console families and offer more information. "I am touched by the massive show of support especially from my fellow airlines," he wrote. "This is my worse nightmare. But there is no stopping." The company switched its logo on its Twitter and Facebook pages from bright red to gray. What role did weather play? Peter Goelz, a CNN aviation analyst, chaired a task force that wrote the Aviation Disaster Family Assistance Act of 1996, which the U.S. Congress passed to provide guidance on how to deal with families when responding to these types of crises. That legislation "set the worldwide standard" in aviation disaster response, according to Goelz, and iterations of it have been adopted by "virtually every country" -- including Indonesia. "The key is families need to hear it first. They need to hear what's going on, and they need to hear it from the investigators," Goelz said on CNN's "State of the Union." "If you don't get the information to the families, it's just torturous." Pope Francis said Sunday his thoughts "are with those on board the missing AirAsia plane" and with their loved ones. CNN's Josh Levs, Pierre Meilhan, Anna Maja Rappard and Yousuf Basil contributed to this report. 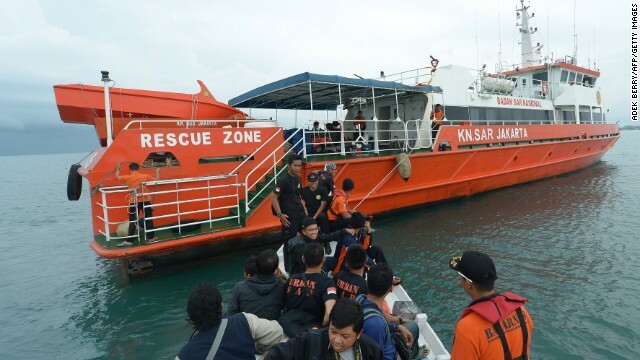 Searchers looking for more bodies and wreckage from AirAsia Flight QZ8501 in the Java Sea faced fresh difficulties with bad weather. New Year's Eve was a stark and painful reminder that many of the victims of QZ8501 were on their way to Singapore to celebrate the new year there. Investigating: What needs to be done? The investigation involves recovering the bodies, accessing the flight data recorders and mapping where debris is found to reconstruct its path. Some may call it serendipity, others divine intervention. Either way, circumstances prevented two families from boarding the doomed flight. The discovery of debris means investigators have taken a big step toward answering some key questions. 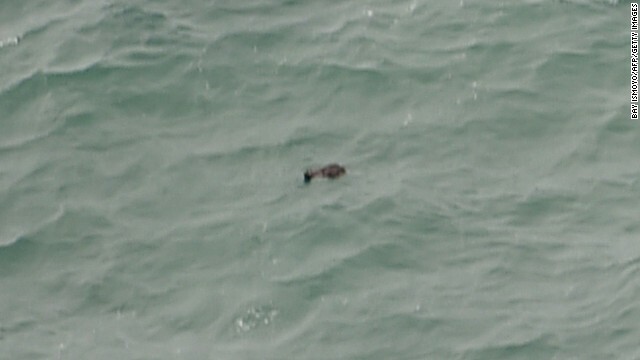 For families of some people on board AirAsia Flight QZ8501, the devastating images came without warning. A family, veteran pilots, a fiance and more. Here's what we know so far about some of the passengers. 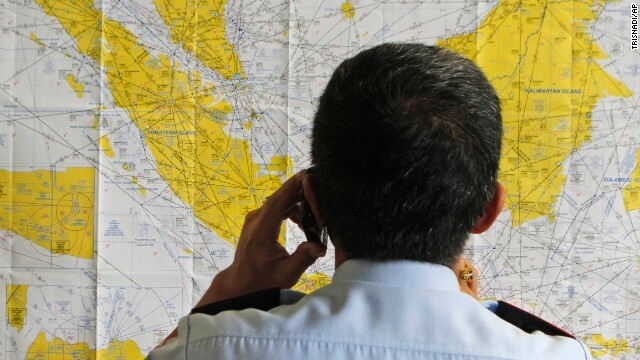 Time line of events leading up to the disappearance of AirAsia Flight QZ8501. Professor Alan Khee-Jin Tan says Flight QZ8501 stirs fears passengers might lose confidence, but AirAsia will weather this difficult period. Air travel in Asia growing too quickly? Safety concerns surrounding booming Asian airline market has raised questions about the AirAsia crash and pilot training. 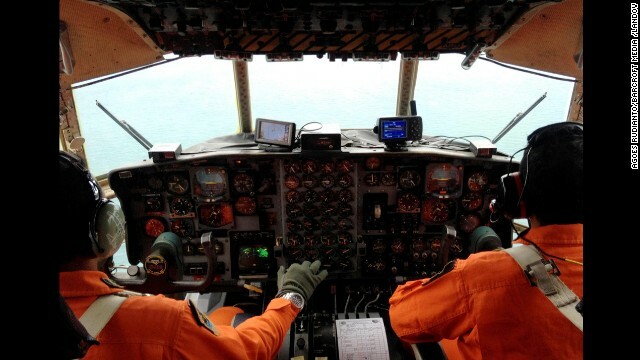 Click through our photo gallery as we track the story of missing Flight QZ8501. 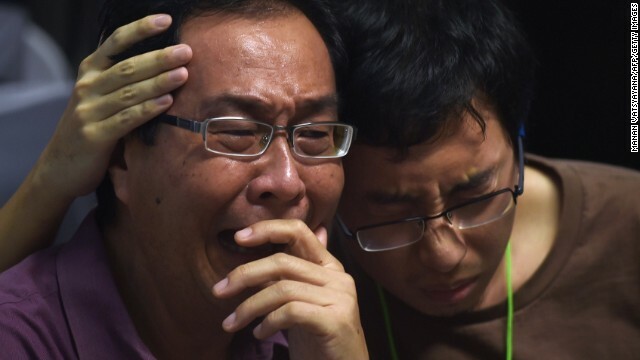 No one can fathom the agony that families of AirAsia Flight QZ8501 are going through -- except the families of MH370. MH370. MH17. Air Algerie 5017. And now AirAsia Flight QZ8501. Is 2014 the worst year in aviation history? 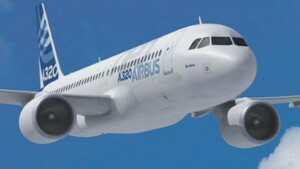 Much has been said about the rivalry between Airbus and Boeing and the Airbus A320 features prominently in this. What you need to know about the boxes that are key to every plane crash investigation.